Oct. 2005～Mar. 2009: Visiting Student, Institute for Solid State Physics, the University of Tokyo, Japan. Oct. 2010～Apr. 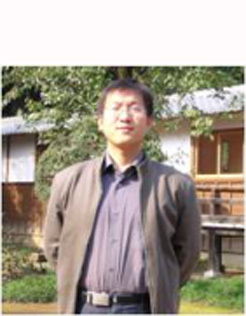 2013 Postdoctoral Research Associate, Center for Nanophase Materials Sciences,Oak Ridge National Laboratory, USA. 1, Organic molecular self-assembly and on-site reaction on metal surface. My major is characterizing the structural and the electronic properties of the surface and interface of functional nanomaterials with single atom resolution using the low temperature scanning tunneling microscopy (LT-STM). So far, more than 20 peer-review papers have been published in the qualified journals, such as Nat. Comm., PNAS, PRL, JACS, Angew. Chem., Nano Letters, ACS Nano, PRB. Yang, B., Lin, H. P., Miao, K. J., Zhu, Z., Liang, L. B., Sun, K. W., Zhang, H. M., Fan, J., Meunier, V., Li, Y. Y., Li, Q. *, Chi, L. F.*, Angew. Chem. Int. Ed. 55, 9881 (2016). Li, Q., Yang, B., Lin, H. P., Aghdassi, N., Miao, K. J., Zhang, J. J., Zhang, H. M., Li, Y. Y., Duhm, S., Fan, J. *, Chi, L. F.*, J. Am. Chem. Soc. 138, 2809 (2016). Yang, B., Bjork, J., Lin, H. P., Zhang, X. Q., Zhang, H. M., Li, Y. Y., Fan, J., Li, Q. *, Chi, L. F.*, J. Am. Chem. Soc. 137, 4904 (2015). Li, Q., Lin, W. Z. Yan, J. Q. Chen, X. Gianfrancesco, A. G., Singh, D. J., Mandrus, D.,4, Kalinin, S. V.*, Pan, M. H.*, Nat. Commun. 5, 5358 (2014). Lv, R. T., Chen, G. G., Li, Q. (contribute equally), McCreary, A., Botello-Mendez, A., Morozov, S. V., Liang, L. B., Declerck, X., Perea-Lopez, N., Culleni, D. A., Feng, S. M., Elias, A. L., Cruz-Silva, R., Fujisawa, K., Endo, M., Kang, F. Y., Charlier, J. C., Meunier, V., Pan, M. H., Harutyunyan, A. R., Novoselov, K. S., Terrones, M.*, Proc. Natl. Acad. Sci. 112, 14527 (2015).